During our transitional months from “winter” into spring in Arizona, our evenings are still pretty cool. So, when I look for something to wear on any given date night, I gravitate toward light long sleeves, and sometimes will tote a jacket along just in case. 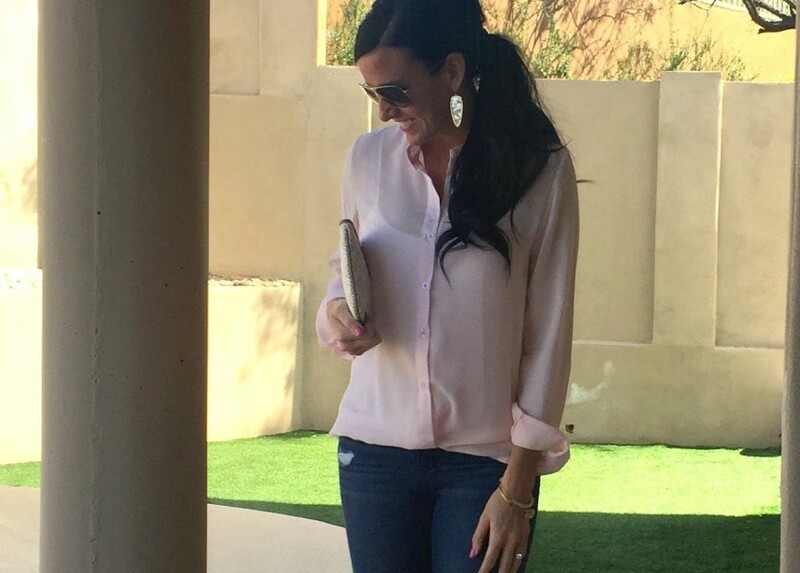 This pastel pink top is from She In, and works perfectly for a spring night out! I decided to wear it tucked into some slightly distressed skinnies, and then paired it with some ankle-strap pointy heels. I wore a cami underneath the blouse, as it is shear. The bottom edges of the blouse are straight and flowy, and should you decide to wear it untucked, it flows loosely. The sleeves are also a great length, but I definitely loved them more rolled up a bit! It just adds more interest to the top. If you’re like me, then you’re dreaming of endless spring fashion! I am an avid review-reader, and was so excited to have found some really well-liked and cute pieces from She In that will be perfect for the spring season. Click on any of the images below to go to the exact product. Other Spring Fashions I am Loving! Thanks for stopping by – enjoy your weekend!